Ninnu Kori Trailer: The Tollywood Natural Star Nani is gearing up for the release of his upcoming film Ninnu Kori. Ninnu Kori has been the most talked about film in the recent past after the first single – ADIGA ADIGA Song – was released by the makers a few days ago. This song is now a smashing hit with the music lovers of Telugu cinema. The Ninnu Kori Movie Story is written by Shiva Niravana who is making a debut with this film as a director.while the dialogues and screenplay are handled by popular writer Kona Venkat.The makers have now released the Ninnu Kori theatrical trailer and The film is touted to be romantic saga between the lead actors Nani, Nivetha Thomas and Aadhi Pinisetty. It seems the film to be a package with all emotions in it. 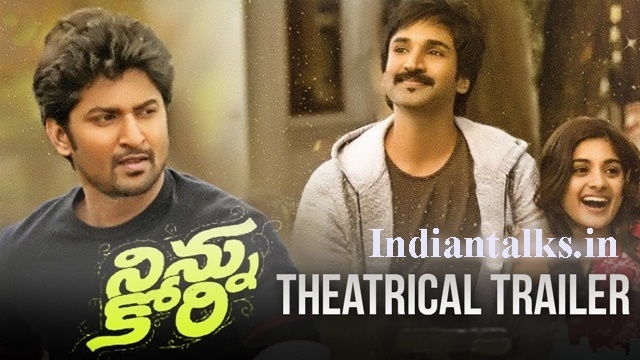 The Ninnu Kori background score is catchy and strikes the right chord emoting what the characters are feeling – from mischief to laughter, emotional drama to action. There is a change of space and pace in the film’s trailer as it gradually progresses.The Ninnu Kori film is being released on July 7th, 2017 worldwide and is being produced by D V V Dhanayya. Tags: Ninu kori, nani ninnu kori trailer, DVV Entertainments, Ninnu Kori Movie Trailer, Ninnu Kori Movie, Ninnu Kori Trailer, Ninnu Kori official Trailer.